If you are looking for friendly, reliable, no-worry party entertainment to keep your guests busy and leave you picture perfect memories of your special day, you’ve come to the right place! Our goal is to WOW your guests and make YOU look good! 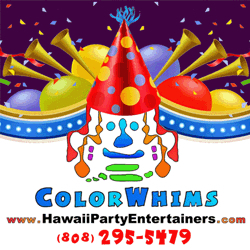 One Call hires Hawaii’s “Most Popular and Requested” Professional Face painter, Balloon Twister, Glitter Tattoo artist and more! Visit our website, send us all your party details, Receive instant Rates, Availability and Monthly SPECIALS. Don’t delay! Early Bookings Get Priority!